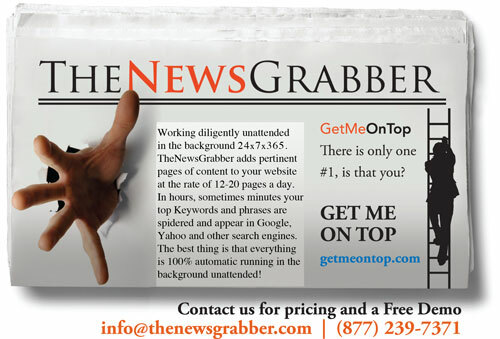 The News Grabber - Most Amazing SEO Add-on Ever! The News Grabber is the results of more than nine months of development and 2500+ hours of programming and has resulted in the most incredible effective tool SEO tool anywhere at any price. This SEO tool is completely revolutionary, its features allow the addition of vital keywords and numerous pages of fresh new and pertinant content to your website each and every day. The News Grabber's SEO building feature will increase your search engine ranking page position (SERP) exponentially. Continuosly building links and Search Engine Rankings, you will begin to quicjkly notice and increase your websites PageRank, and search terms that you will be found at the top of Google, Yahoo, MSN etc. If you are looking for ways to boost the traffic to your site, The News Grabber will serve as your automated web traffic solution! As proof of the extraordinary power behind The News Grabber, simply view the results associated with one of our clients web sites (click here to get receive free SEO report) showed an SEO page view increase of over 35%. The NYC Knitting Cafe website http://www.ThePointNYC.com/news in February 2007 had page views of 97,000, TheNewsGrabber SEO tool contributed to an increase to over 137,000 views in March 2007 and 440,101 views by October 2008!! The News Grabber is an amazing search engine-positioning tool that is guaranteed to improve your search engine ranking in Google, Yahoo, Live.com and other top search engines. TheNewsGrabber SEO building website program is not offered by any other company at any price! If you're looking for fast, incredible, and dramatic results, The News Grabber is one of the best SEO, search engine positioning and optimization tools your website will ever need. The News Grabber will automatically update (multiple times) each and every day and automatically imports the latest news articles from around the Web (pertinent to your web sites content), creating a complete news section for your site. We automatically ping the Search Engines, and once indexed in search engines you will immediately begin to see additional SEO web traffic for not only your selected key terms, keywords and phrases, but in dozns of other long tail keywords as well, all automatically. Remember, no intervention or work is needed on your part, each and every time The News Grabber postsa a new article o your website, it will automatically ping Google and other major search engines to notify the search engines of new content, often times yur site will be indexed multiple times per 24 hours, with new results being added to the search engines. Search engines such as Google, Yahoo, MSN seek out new and fresh content, and thanks to the automated SEO updates, you will witness a huge increase in search engine traffic to your website. TheNewsGrabber can also assist in Google AdSense building and integration. The News Grabber website add-on program is constantly evolving SEO Search Engine Optimization tool: incredible new features and improvements are established and added on regular basis, and any future releases and updates are provided to you as a contingency of your maintenance agreement. Optional advanced seamless AdSense integration with high click ratio. Built-in Google site map generation and submission. Completely and constantly SEO and search engine optimized. Developed to work in conjunction with Wordpress Blog software. Dynamic Meta Tags, which changes based on web page content. High click thru rae, fully SEO custom layout and design to integrate with your web site. Multiple streams of income available for quick and high ROI. Related posts feature, which also will compel the Search engine bots to crawl and index your website deeper. Search engine friendly url(s) Adds the pertinent headlines to your url, no long convoluted search engine un-friendly url's. Your custom "news" website will generally get indexed in Google extremely fast and then re indexed up to 20 times a day! TheNewsGrabber is absolutely the most advanced, custom coded website add-on allowing for complete hands free, self-updating, 100% automated traffic generation. The News Grabber is available from no other company and at any price: it is an investment that no Webmaster should be without. The automatic submission of your posts will not only help you build backlinks, but will also help you increase your Google PageRank quickly, generating additional page views as well as higher rankings in Google, yahoo, MSN and many of the major search engines. Duplicate content is penalized by search engines like AOL, Google, MSN, Yahoo Live.com, as well as others. News Grabber ensures that your site will not be penalized for duplicate content: the program incorporates a patent pending incredible, revolutionary technology that can rearrange sentences and/or replace words with synonyms; which provides your site with both new fresh and unique content daily. Fresh content ensures that your search engine position is boosted and posts can be filtered automatically through an advanced content adjustment filter. TheNewsGrabber's newest feature can routinely and automatically insert pre-selected, pre-defined vital keywords, key phrases or entire paragraphs to the body text of each existing "post" and optionally again to every post title established. Once the predefined keyword/phrase/paragraph or material is utilized, The News Grabber can then automatically delete the predefined keyword content. The automatic deletion feature ensures that content will not be duplicated and that your website always has fresh and interesting material for web visitors. Fresh material makes your website attractive to your target audience as well as search engines. The News Grabber allows you to define keywords automatically maximizing your search engine optimization. Finally, The News Grabber also makes it possible for you to improve your AdSense targeting with the use of critical keywords and phrases. TheNewsGrabber allows for easy and efficient keyword substitution of existing material! We can have TheNewsGrabber automatically substitute the words "Computer Applications" with a word like "Software"? The NewsGrabber optional automatic keyword replacement feature can add/or replace existing keywords in order to maximize Adsense and Search Engine targeting. This exceptionally impressive feature permits the system to substitute approved keywords and key phrases with new predefined keywords. In turn, you build search engine rankings via vital keywords! Simple setting will allow for TheNewsGrabber to exchange the word "Search Engineering" with the acronym "SEO"? SEO has never been easier! Every time new content or articles are posted on your website, The NewsGrabber will immediately notify search engines via the "post and ping" strategy. Google, Yahoo, ASK, and MSN are immediately notified of your new material, and this is an incredibly effective way for to improve your website search engine ranking! Not only will your website be spidered frequently, but you will be amazed by the increase in your website traffic, stickiness, and time spent on your web site! The NewsGrabber tool offers automatic tag generation and it can auto generate Technorati tags based on carefully selected keywords and key phrases. The result: backlink building capabilities and of course, more traffic for your website. Best of all, the Technorati Tag generation is completely hands free, requiring no maintenance or intervention on your part. The NewsGrabber has a special feature that allows you to select what categories specific feeds post to. Using correct categories is critical in order for you to be able to build content, and to improve search engine rankings. The NewsGrabber offers a feed engine that parses, pulls, and then stores unlimited RSS/Atom feeds from a variety of sources. Feeds can come from affiliate programs, blogs, marketing resources, and other forms of XML aggregation. Again, we give you the ability to define every feed category. If you are looking for specific news material to post to your site, the News Grabber allows you to select the type of material you would like to include on your website! Specify posts based on keywords: if you want to add content that focuses on "Search Engine Optimization" we can set the NewsGrabber filter to use feed and posts that are related to your selected subject. No matter what the subject, TheNewsGrabber will easily get fresh content to appear on your site: if you are looking for content associated with "Paris Hilton," we will set the filter engine to define the subject area of interest as "Paris Hilton" and the NewsGrabber will do all of the work for you. What's particularly nice about the filter engine of the NewsGrabber is that it allows full control of the content and the keywords you use on your site, thereby giving you the power to use relevant Google Adsense keywords and to improve your Search Engine Page Ranking, Google PageRank, and Google Juice. If you would rather have the full content of any post or news article appear on your site, the NewsGrabber makes it possible to choose between full and partial story content. The NewsGrabber ensures that all images are automatically downloaded from the original source and then added to your own server or directory. Thus, the News Grabber is a powerful tool indeed, ensuring no broken links or hot linking. You can thereby avoid losing and image if it is removed or changed from a server. The NewsGrabber's re-link engine feature permits the creation of links out to specified keywords existing in any feeds. Thus, visitors can be pointed to other pages within your existing website, to outside websites, and to pre selected affiliate links. The re-link engine feature provides a way to add additional income streams and allows you to establish hyperlinks out of all specified key word/phases in pulled feed(s). The NewsGrabber allows you to easily generate web pages and we content that is 100% searchable. In an instant you can locate articles, keywords, and other information within any content. The NewsGrabber has a thumbnail engine feature that will automatically create thumbnail previews based upon specifications you select. You can specify the width and height preference, for each and every post based on the images that accompany the post. If a post has no images a random thumbnail will define it.